Instead of hiring an employee, paying taxes and providing benefits, outsourcing is a great alternative. If you are open minded to outsourcing some or all of your estimating needs, I can help. Hi, my name is Ronnie Neely. I am originally from the Birmingham, AL area where I grew up and began my career. I have been in the commercial construction business most of my adult life which lead me to the Florida gulf coast. I am looking for opportunities elsewhere from trustworthy business establishments such as yours. I currently live in Navarre, FL. I have over 25 years experience in the commercial construction industry, specializing in metal framing, steel trusses, drywall, insulation, acoustical ceilings and more. I am a well organized individual, a leader taking great pride in my work and looking out for my employers and/or client’s best interests. I currently perform freelance estimating and management services, dba, ERN SERVICES, Inc.. I work from my home office, telecommunicate and travel for face to face meetings when/if necessary. If desired, I can work discreetly behind the scenes or conduct business for you as an authorized representative of your company just as you would expect of any in-house employee. 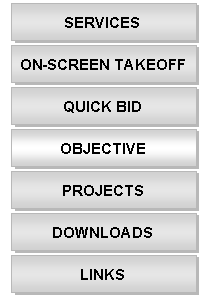 We offer On Screen Takeoff and Quick Bid estimating, management and administrative services customized for you to meet your needs. Our work is done electronically and transferred by e-mail and FTP. We set up a customized data base with your preferences, net unit pricing, burden and markups exclusively for your projects. All information is strictly confidential and secure. Our work is performed on an hourly basis. Time is itemized, logged and backup provided along with weekly invoices. We can handle any size project and most anything you need, freeing up your time for more important things. I would be happy to discuss my business services in more detail and answer any questions at your earliest convenience. My resume, samples of my estimating, work agreement and invoicing are available for your review by file download from the DOWNLOADS page. I am loyal, trust worthy, humble and confident we can perform admirably and represent your company well. Consideration of my services would be greatly appreciated. Professional construction services customized to fit your needs.